Amidst a growing number of headlines about rapid and turbulent change in the Arctic, a major new study, the Arctic Resilience Report, was launched in Stockholm on Friday last week. The report, under the auspices of the Arctic Council, brought together researchers from no less than 11 research institutions and is the first comprehensive assessment of ecosystems and societies in the region. The findings of the report make for uncomfortable reading as the fast changes occurring in the Arctic, from record high temperatures and melting sea ice to vegetation shifts and loss of Indigenous Peoples’ livelihoods, are increasingly well recorded but miss the bigger picture. Analysis suggests that all Arctic nations are exposed to at least 10 of the regime shifts, but Canada, Russia and the USA are exposed to the risks of almost all of the identified shifts. However, with the Arctic’s role in climate regulation of global importance, the report finds that regime shifts in the far North could have cascading effects to almost the entire planet, from the Indian monsoon to the desertification of the Amazon. Whilst some tipping points are well known, the report finds that many of them are poorly understood, especially in a systemic context, and calls for far more research to be conducted. The study’s combined social and ecological approach provides a strong framework for future cross-disciplinary research. On the drivers of change, Carson points to “a single, powerful driver that repeats itself over and over again… climate change.” To avoid these changes, the report urges “strong, global action to mitigate climate change” and stresses the “urgent and immediate need” to build resilience in the Arctic. As surprise becomes the new normal, and the Arctic becomes increasingly subject to multiple and abrupt changes, resilience of Arctic communities (“the capacity to buffer and adapt to stress and shocks, and thus navigate and even shape change”) becomes ever more crucial. 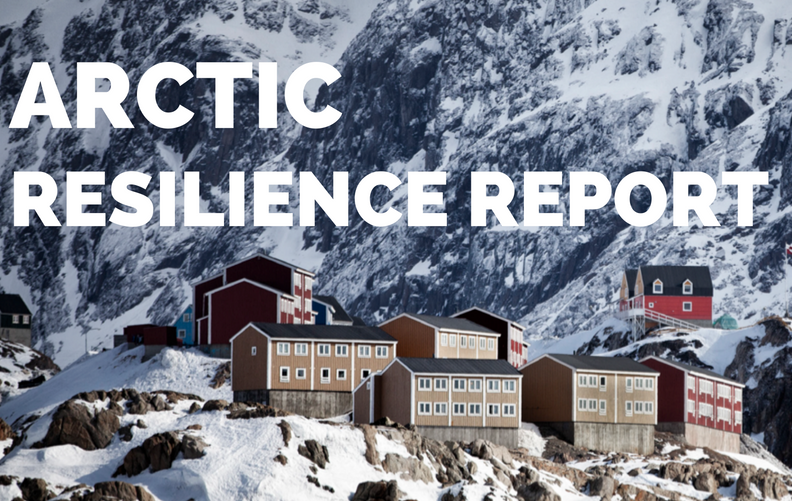 By examining evidence from across the Arctic, the report indicates that the ability to self-organise and respond to challenges as a community are crucial to strengthening resilience. In several cases, erosion of resilience was attributed to actions of national governments. This leads to the finding that empowering and supporting Arctic communities to self-organise and find their own solutions to the coming challenges is the key to building resilience rather than undermining it. As the theme of the US Arctic Council Chairmanship is “One Arctic, Shared Responsibility” however one aspect the report highlights is the difficulty in bringing together the often incompatible goals of differing actors in the Arctic. Building a common understanding of how the social and ecological aspects of the region are intertwined is the first key step to meshing the varying interests in the Arctic. According to the report, the Arctic Council’s role in bringing together this shared responsibility will become increasingly important, and the organisation must work harder to strengthen connections across issues both in research and in policy. As the Arctic Resilience Report has succeeded in crossing the gap between disciplines, science and policy, the question that remains is how to translate the findings of the report into practice. Speaking at the report’s launch, lead author Sarah Cornell expressed her concern that existing knowledge would not be utilised and the report risks gathering dust on the shelves of those in power. However, Sweden’s Environment Minister Karolina Skog, praising the report for bridging the gap between science and policy, gave positive indications that the political momentum exists, with a rallying call: “we need to do it, and we need to do it now.” The report’s authors shall later release a set of policy recommendations, but the study already gives examples of how to build resilience in the Arctic region and better integrate existing knowledge, emphasising the importance of the guiding role of the Arctic Council. For more perspectives into the findings and significance of the report, watch our two-part interview with Marcus Carson, Project Director of the Arctic Resilience Report and Senior Research Fellow at Stockholm Environment Institute: part 1 & part 2. Nic Craig serves as an Associate in the Energy Unit at Polar Research and Policy Initiative. He is currently completing an MSc in Climate Change at the University of Copenhagen. Nic holds a BSc in Geography and German from the University of Exeter, through which he spent a year studying in Helsinki. Nic has a background in renewables and energy policy.